Chicago’s current 311-reporting process does not work to protect renters against their slumlords. A mandatory rental housing inspection program with strong enforcement power is imperative for Chicago and the health of its communities. Below is a brief photographic summary of the conditions MTO witnesses on a regular basis. Low-income renters experience higher rates of disease than their higher income counterparts. In my work as a healthy homes organizer, it has become strikingly clear why. 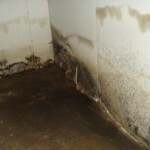 We have entered hundreds of apartments over the past few years and in them, seen deplorable housing conditions that were the direct cause of a child’s disease which brought us to that apartment in the first place. For some unconscionable reason, the landlord chose not to invest the money needed to maintain the apartments in a livable condition and the city was often unresponsive to calls for help from the parents of these sick children. Because of decades of activism, the City of Chicago has set up a system that is helpful to parents whose children have been lead poisoned. But – children are still the proverbial ‘canary in the coal mine’ in the vast majority of cases. There is no program in place to prevent kids from lead poisoning and in particular, the most vulnerable children suffer. 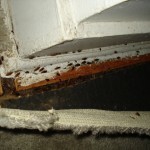 There are even fewer controls in place for other healthy homes issues such as cockroach and rodent infestations, and mold problems. 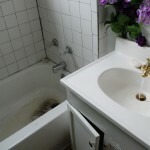 As of right now, there is little help in place for renters enduring unhealthy housing and absentee landlords. These conditions can be particularly harmful to children with asthma and other respiratory ailments. In most cases, especially in today’s economy, parents do not have the option to pick up and move. Instead, they make the difficult choice of having a roof over their family’s head or watching their kids suffer from their illnesses that are exacerbated right in their own home. There needs to be programs with strong enforcement mechanisms for these families to turn to in order to correct these grossly negligent – and sometimes criminal – building code violations. Children living in unhealthy housing will suffer the effects of environmental injustice for the rest of their lives. This fact has been repeatedly proven and documented in numerous medical and public health academic journals. A recent Shriver Center report demonstrates how socioeconomically-integrated, safe, affordable housing offers children access to good schools, stability, and the health necessary to achieve their potential. 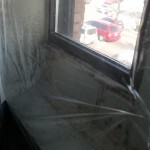 MTO is calling on Chicagoans to support a mandatory inspection program that would identify healthy homes issues and force landlords to maintain their buildings according to the Chicago building code requirements. Warning: Some of the following photos are graphic and may be disturbing for sensitive viewers. 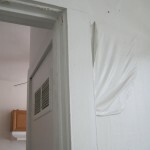 Every time someone in this apartment went to the bathroom, they’d have to risk a leak from the bathroom directly above them. Here on the toilet seat, the leaking from above is quite visible. 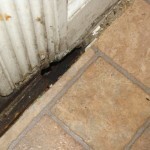 Holes like this between the floors and walls are used as entry points for rodents. They should be filled with steel wool and then caulked to keep the rodents out. Holes like this one were pervasive throughout the apartment. Pesticides only tackle the symptoms of pest problems, not root causes like these holes. This window in the front room sat unrepaired for the entirety of their tenancy. 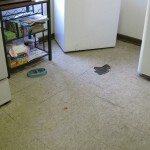 The landlord was notified of the problem in writing and knew small children lived in the home, yet did nothing. 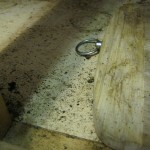 A visit to the basement explained the lingering moldy smell in the building. 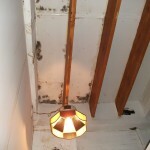 Severe mold and moisture problems were on nearly every wall in the basement. There was a child lead poisoned in the home. Parents of lead poisoned children in Chicago receive a report from the city detailing where lead hazards are found. 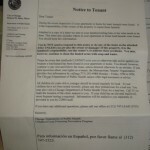 A letter to the tenant regarding lead hazards from the city of Chicago. 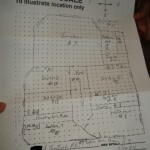 A map of lead hazards from the city lead inspector. 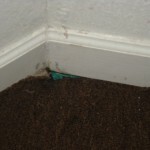 Here, the tenant showed me just how bad the roach problem was. Unloading can after can of Raid was ineffective and only made her asthmatic child sicker. Roaches can squeeze through cracks thinner than a dime. 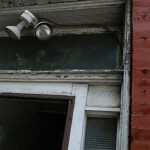 The landlord of this building was unresponsive to requests for proper extermination. 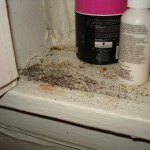 Salt-and-pepper like spots are roach droppings and signs of a roach problem. They also can trigger asthma attacks. When pesticides are to be used, gel pesticides are more effective and far safer than aerosol pesticide. Boric acid is also a safer and more effective pesticide to use against roaches. 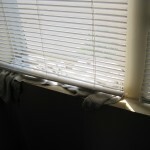 This apartment has lead hazards by the windows. 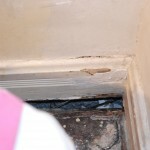 The parent did her best to cover the lead hazards until the landlord abated the problem. 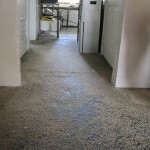 The floors were also in poor condition. Another entry point for mice and other rodents. 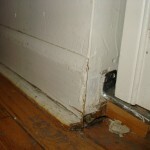 Mice can enter through holes less than a centimeter in diameter. 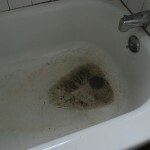 This tenant had a reoccuring problem of “water” leaks from the bathroom upstairs. 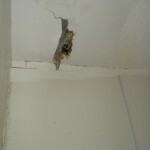 The landlord would come and “patch it up” only for the problem to return within days. 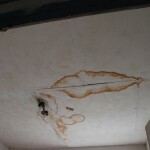 The moisture problems also lead to paint problems as well. 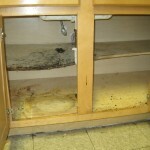 A water leak under the sink warped the cabinet shelves and attracted roaches. Often small problems like leaks turn into larger problems because the landlord refuses to address the problem when it is first reported. 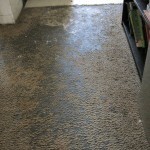 A closer view of the water damage. Salt-and-pepper-like spots are roach droppings and a signal that a larger problem exists behind the scenes. 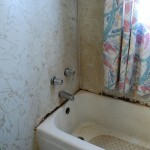 A mold problem around the tub. The problem will continue worsen until it is properly addressed. 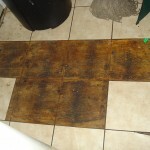 Tenants are often forced to deal with flooring problems that landlords refuse to repair. All despite paying full market rent. After months of back and forth, the landlord here agreed to exterminate the apartment for bed bugs. 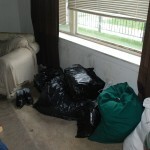 When dealing with bed bugs, a great deal of preparation must be done by the tenant including putting all clothing and bedding into plastic bags that are then sealed. The exterminator pointed out these “nests” of bed bugs on the joints between the walls and the ceiling. 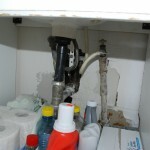 The problem was very severe in this unit. 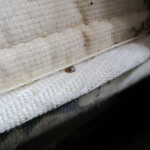 The longer a landlord takes to address a bed bug problem, the more units are affected and the more severe the problem becomes. This building has been in foreclosure and remains so. 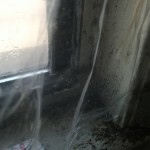 The windows grow mold and also are a lead hazard. The family cannot afford to move and are forced to remain in an apartment that affects their family’s health on a daily basis. 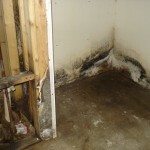 Condensation can lead to very severe mold problems. 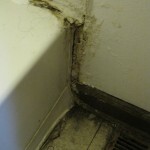 Mold can be a trigger for asthma and other respiratory problems. 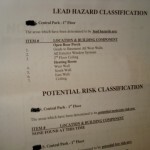 More mold and lead hazards. 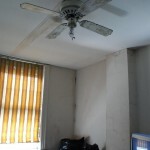 In addition to the windows, there is also a mold problem along the ceiling. 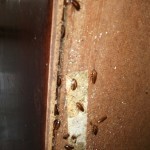 Where there is a moisture problem, there may be a burgeoning roach problem as well. 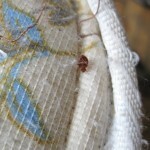 There is a bed bug epidemic in Chicago. 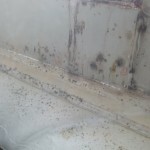 This landlord “sprayed” for bed bugs. I went there the next day and found them strolling around as if nothing ever happend. 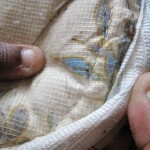 They can be found in the folds of mattresses, among many other places. Adult bed bugs are approximately the size of an apple seed. 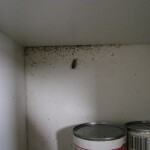 This tenant also had a cockroach problem. 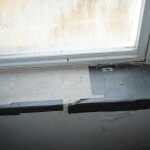 Leaky windows can later lead to lead hazards. 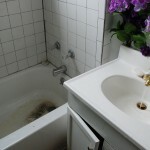 When the faucet runs, the tub begins to fill up soon after with water and pipe dirt. 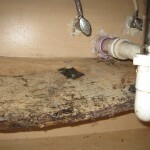 The tenant demonstrated the tub back up. The sink has been running for about 10 seconds so far. About 30 seconds in, there is a significant amount of standing water in the tub that will not go down for another hour or so. 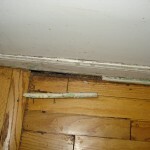 Holes around pipes are common entry points for rodents. This carpet is in a HUD subsidized building. 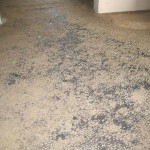 Management companies receive generous funds to maintain units against general wear and tear, yet they refused to replace this severely worn carpet. 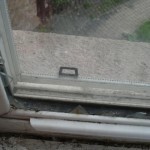 The tenant had no recourse. The “carpet” that management informed me was perfectly fine. 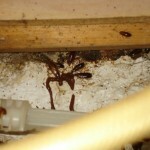 A structural problem that invites a pest infestation. 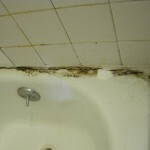 An ever-worsening mold problem around the tub. 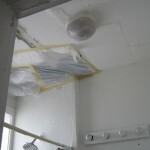 A moisture problem was also evident in the ceiling. 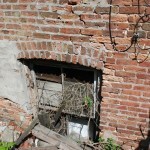 Entry points into the basement like this broken window will cause a rodent problem no matter how good the housekeeping is. Lead hazards are found wherever there is disturbed paint on a pre-1978 building. 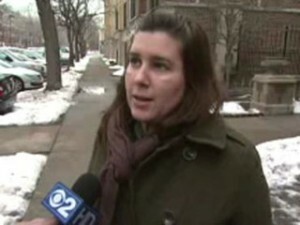 Hyde Park tenant Melissa Michaels hopes a proposed ordinance will induce property owners to be better landlords. The city of Chicago has a message for slumlords: You will not be rewarded with city loans or contracts. CBS 2’s Jim Williams reports the city council is close to passing a law that would put pressure on bad landlords to fix their property.